In what could have been his last college baseball game redshirt senior Luke Jarvis line a fastball into the left center field gap. 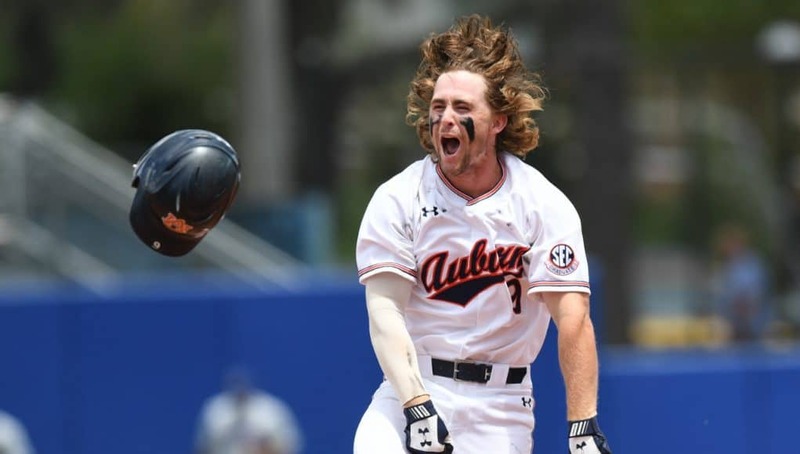 As he rounded first base the ball dropped, Cade Evans touched home and the Tigers walked off the field with a 3-2 win, their first Super Regional win in school history. That’s the only word Jarvis could use to describe the scene as he turned to his teammates after extending Auburn’s season for at least one more day. It was as good of a college baseball game as you could hope for and more of a pitching duel than the Brady Singer-Casey Mize matchup from 24 hours earlier. Florida threw Jackson Kowar who had struggled in his previous three starts. Auburn went with its Saturday starter Tanner Burns, who was named a Freshman All-American earlier this month. Burns didn’t have his best stuff but battled early. He stranded four runners in the first three innings, while Kowar retired the first 10 batters he faced. The Gators got on the board in the fourth inning. Blake Reese worked a one-out walk and scored all the way from first when Nick Horvath doubled to left field. Kowar’s one mistake of the game came in the fourth inning when Steven Williams lifted a fastball into the visitor’s bullpen to tie the game at one. Offensively the Gators hit into three double plays, two of which ended innings. They were also hitless (0-8) with runners in scoring position. Kowar did his part. The junior making his last appearance at McKethan stadium dazzled. He went back out to the mound to start the seventh inning with his pitch count still low but Auburn started barreling up some pitches. Brendan Venter lined out to India, “I thought the ball was by his head, a reactionary play,” Thompson said of it. After a strikeout Jay Estes singled hard up the middle and advanced on a wild pitch. Luke Jarvis crushed a ball back up the middle that almost took Kowar’s hand off. O’Sullivan made the decision to pull Kowar after that but freshman Jordan Butler quickly found trouble in the eighth inning and gave up the go-ahead run. Florida went into the ninth trailing by one but Austin Langworthy launched a solo home run to right field, his third of the season and first at home, to tie the game at two. Butler walked Venter to start the ninth and was pulled in favor of Michael Byrne after falling behind 2-1 to Edouard Julien. Byrne got Julien to strike out on the next two pitches but gave up a single to Jay Estes before Jarvis’ heroics. The Gators and Tigers will play a decisive game three tomorrow night on ESPN at 8:30. Florida will throw one of two freshmen — Jack Leftwich or Tommy Mace and Auburn will match that with a redshirt senior LHP Andrew Mitchell. Next articleWill Gators have déjà vu all over again?